After two years, Emperor Leo the Isaurian [717-741], who was originally called Konon and was an iconoclast, deposed the most pious Theodosios and seized control of the empire. Immediately he forcibly banished from the patriarchate with cudgels and swords Saint Germanos [715-730], most-holy and great among patriarchs, because he refused to obey his ungodly decrees, to not venerate the holy icons. Leo then hastened to remove and commit to the flames the holy icon of Christ our God, the one fixed above the gate of Constantinople among which was one called the Holy Chalke Gate* because of this image. * Chalke means "brazen," so named either for the gilded bronze tiles of its roof, or for its bronze portals. ** Spatharios, lit. "sword-bearer," a member of the elite imperial guard. *** He was an iconoclast and placed on the patriarchal throne by Leo III; the original Greek text calls him the "fatriarch" instead of patriarch, which is a pun since "fatria" in Greek means "conspiracy", and this became a common name for iconoclast patriarchs. **** Ten Martyrs, both men and women, are commemorated on August 9th. 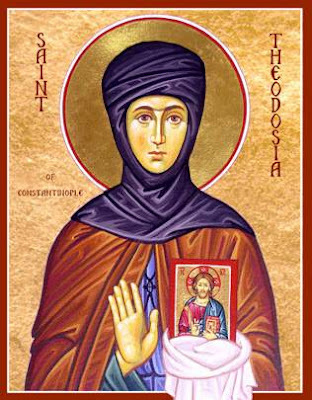 **** The feast of St. Theodosia was moved from July 18th to May 29th. Joseph Bryennios speaks of her miracles. 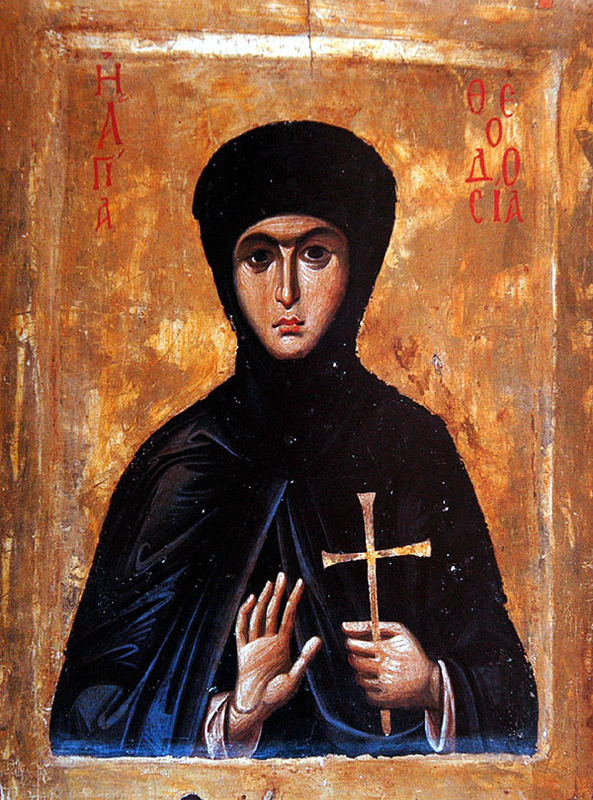 Saint Nikodemos the Hagiorite composed a Divine Office in her honor.